camera to inspect the culvert. Culverts under highways aren’t always noticeable, but they’re important. They collect water runoff and prevent it from settling under the road surface, something that can cause dips or potholes. 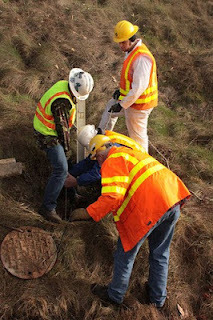 Our maintenance crews noticed during a recent inspection that the culverts under US 2 near Snohomish were deteriorating. The metal pipes used to construct the old culverts were corroded, which prevented them from successfully doing their job. This summer, WSDOT crews will replace five culverts underneath both directions US 2 between the Ebey Slough Bridge and Bickford Avenue. The new culverts will be made of thick, heavy, rubberized plastic, which will last longer and make long-term maintenance cheaper. Culvert replacement is a big, invasive task: crews must open up the roadway, remove the old culverts and install the new ones. Since it’s not something we can easily do overnight, crews will close one direction of US 2 on six separate weekends this summer, starting in August. Closures will last from Friday night through Monday morning, and work should wrap up this fall. Detours will be in place during the closures. Drivers can expect to use SR 9 and 20th St. to access US 2 when it is closed in the eastbound and westbound directions. Complete detour maps are available online. The culvert replacement work under US 2 is the first part of a larger project that includes building a new Bickford Avenue overpass. 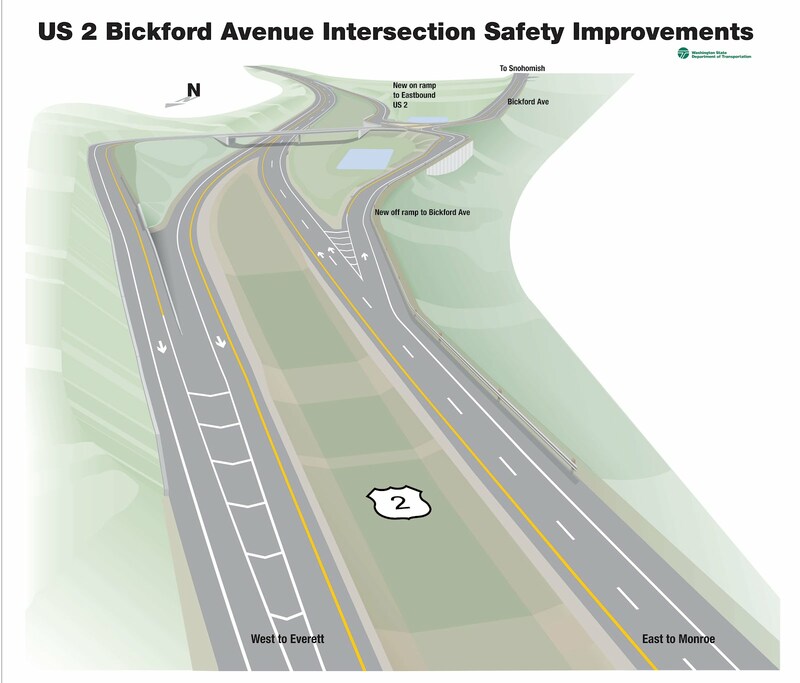 For regular drivers, construction of a new overpass from Bickford Avenue to westbound US 2 means no more left turns across traffic and a safer intersection overall. The Bickford Avenue intersection is one of the last intersections on US 2 near Everett where drivers have to turn across traffic without the aid of an overpass or signal. Taking traffic over US 2 rather than across it should help reduce the number of collisions and help reduce congestion in the area. Crews will also install upgraded lighting for more visible, stress free driving. This work isn’t as fast as culvert work, and we expect to be done with this part of the project in the fall of 2013. For more information about the Ebey Slough to Bickford Culvert Replacement and Bickford Avenue Overpass, including links to photos, visit the project websites. Keep up with construction closures by checking the Snohomish County Construction Update page, which is updated weekly. This morning we kicked off day 2 at I/O to talk about the open web—one of the most amazing platforms we have seen. To put things in perspective, today there are more than 2.3 billion users on the web—a staggering number, but it only represents one-third of the world’s population. There’s still a lot of opportunity for growth. Chrome, which we built from the ground up as a browser for the modern web, has seen tremendous adoption. Thanks to many of you, Chrome has nearly doubled since last year’s I/O—from 160 million to 310 million active users around the world. As more and more of you live your lives online, we want to to help make it easy for you to live in the cloud...seamlessly. One of the most exciting shifts is the explosion of the mobile web. When Chrome first launched, many people were tethered to a single computer. Today most people use multiple computers, smartphones and tablets. With that trend in mind, our goal is to offer you a consistent, personalized web experience across all devices. In February, we released Chrome for Android, which exited beta this week and is the standard browser on Nexus 7, a powerful new tablet. Starting today, Chrome is also available for your iPhone and iPad. That means you can enjoy the same speedy and simple Chrome experience across your devices. Also, by signing in to Chrome, you can easily move from your desktop, laptop, smartphone and tablet and have all of your stuff with you. A modern browser is just one ingredient of living online seamlessly. We continue to invest in building cloud apps, which many people rely on daily. Gmail, which launched in 2004, has evolved from a simple email service to the primary mode of communication for more than 425 million active users globally. We’ve also built a suite of apps to help users live in the cloud, including Google Documents, Spreadsheets, Calendar and more. At the hub of this cloud experience is Google Drive—a place where you can create, share, collaborate and keep all your stuff. Ten weeks ago we launched Drive and in 10 weeks, more than 10 million users have signed up. Today we introduced more capabilities, including offline editing for Google documents and a Drive app for your iPhone and iPad. Drive is also seamlessly integrated into Chrome OS. With Drive available across Mac, Windows, Chrome OS, Android and iOS, it’s even easier to get things done in the cloud from anywhere. With the help of Chrome and and the growth of Google apps, people are discovering new ways to get things done faster, connect with others, and access their information no matter what device they’re using. This is what we call “going Google.” And it’s not just individual people. Schools, government institutions and businesses—big and small—are also “going Google.” Sixty-six of the top 100 universities in the U.S., government institutions in 45 out of 50 U.S. states, and a total of 5 million business are using Google Apps to live and work in the cloud. None of what we shared onstage at I/O today would be possible without the awe-inspiring work being done by a global community of developers and the continued support of our users. We can’t wait to see what you do next. This morning at the Google I/O conference we did a special kind of demo. I'm very proud of the talented skydivers, mountain bikers and rappellers we worked with to push technology limits while showing the amazing potential of Project Glass. Check out one of their practice jumps. We want to share more about this demonstration with all of you, so please tune in live tomorrow—weather permitting!—at roughly 11:00a.m. PDT on YouTube. You might just catch another Hangout in Air. Update June 28: The link for the demo today has changed. Tune in to this YouTube link to watch. For our international readers, this post is also available in French, German, Italian, Japanese, Portuguese and Spanish (Latin America, Spain). - Ed. A year ago we started a small project called Google+—to bring friends and family closer together, and to inspire new connections through meaningful conversation. Today more than 250 million people have upgraded to Google+, and we want to give thanks. To you. It's your support and your voice that give the service soul, and we’re grateful. We figure the best way to show our appreciation is to keep listening and making improvements, so today we're rolling out two major updates in response to your feedback: Google+ for tablets, and Google+ Events. Back in May we introduced new versions of Google+ for Android and iOS phones. In both cases we went native (with gestural navigation, fullscreen media and face-to-face video), and it’s had a powerful impact on community engagement. In fact, more people now use Google+ from a mobile device than a desktop computer, and today’s tablet release will quicken this trend. The Android app is rolling out to phones and tablets later today (v3.0), and the iPad update is coming soon. To celebrate is human. It’s how we connect with others, honor friends and family, or simply unwind after a long week. We save the date for picnics, parties and nuptials, and we cherish these moments for a lifetime. Unfortunately, the subtlety and substance of real-world events is lost online. Today’s online event tools are really just web forms that ask, “Are you going?” Worse yet, they bail when you need them the most: during the actual event, and after everyone leaves. In life we plan, we party and we keep in touch. 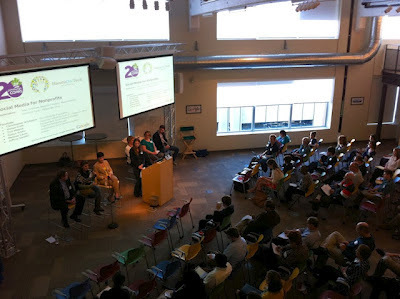 Software should make all of this more awesome, and that's exactly our aim with Google+ Events. Google+ events also appear in Google Calendar automatically, and guests’ updates arrive instantly in the stream. The end result is a useful and beautiful place to manage your party. Photos are the cornerstone of any great event. They get people laughing and smiling, and they let us relive our favorite moments after the fact. The challenge—especially with the explosion in smartphones—is that too many photos get stranded in too many places. We struggle to even find people’s photos, let alone enjoy them all in one spot. Fortunately, Party Mode fixes these problems with a single tap. Once you’ve enabled Party Mode on your mobile device, all of your new photos get added to the event in real-time. And as more guests turn on Party Mode, more pictures will instantly appear to fellow invitees. In this way Google+ Events gives your party a visual pulse; we’ve even added a "live slideshow" you can proudly project during the event. Once the guests go home, it's natural to reflect on the evening's events. We reminisce about the food, or the last dance, or the sparkle in someone’s eye. And we bask in the afterglow of shared experience for as long as memory allows. With Google+ Events you can now relive the party whenever you want, with a captivating and comprehensive set of photos. Just visit your event page after it’s over, and you’ll see everyone’s pictures and comments in chronological order. You can also browse by popularity, photographer or photo tag with a few clicks. It’s easy, immersive and awesome. Google+ has come a long way in a year, but we know we've got a long way to go. Fortunately we serve a community that's filled with thoughtful, committed individuals, and together we're creating something special. +1 person at a time. Last year at Google I/O, we talked about momentum, mobile and more. This year, we’re picking up right where we left off. More than 400 million Android devices have now been activated—up from 100 million last June. And twelve new Android devices are activated every every second—that’s more than 1 million a day. Today, we’re rolling out a new version of Android called Jelly Bean, adding more entertainment to Google Play, and introducing two powerful—yet distinctly different Nexus devices to bring you the best of Google. Jelly Bean builds on top of Ice Cream Sandwich. It makes everything smoother, faster and more fluid. For example, notifications are now more dynamic: if you’re late for a meeting or missed a call, you can email or call directly from notifications. The keyboard is smarter and more accurate, and can predict your next word. And voice typing is faster, working even when you don’t have a data connection. We’ve redesigned search from the ground up in Jelly Bean, with a new user interface and faster, more natural Voice Search. You can type your query or simply ask Google a question. Google can speak back to you, delivering a precise answer, powered by the Knowledge Graph, if it knows one, in addition to a list of search results. Today’s smart devices still rely on you to do pretty much everything—that is, until now. Google Now is a new feature that gets you just the right information at just the right time. It tells you today’s weather before you start your day, how much traffic to expect before you leave for work, or your favorite team's score as they’re playing. There’s no digging required: cards appear at the moment you need them most. Starting in mid-July, we’ll start rolling out over-the-air updates to Galaxy Nexus, Motorola Xoom and Nexus S, and we’ll also release Jelly Bean to open source. Google Play is your digital entertainment destination, with more than 600,000 apps and games plus music, movies and books. It’s entirely cloud-based, which means all of your content is always available across all of your devices. Today our store is expanding to include magazines. We’ve been working with leading publishers Condé Nast, Hearst, Meredith and more to offer magazines like House Beautiful, Men’s Health, Shape and WIRED. Now, you can also purchase movies in addition to renting them. And we’re adding television shows on Google Play—in fact, we’re adding thousands of episodes of broadcast and cable TV shows, like "Revenge," "Parks & Recreation" and "Breaking Bad," from some of the top studios, like ABC Studios, NBCUniversal and Sony Pictures. You can play back movies and TV shows on all your Android devices, through Google Play on the web, and on YouTube, and soon we’ll bring the experience to Google TV devices. Movie purchases, TV shows and magazines are available today on play.google.com, and will roll out to Google Play on devices over the coming days. All of this great Google Play content comes to life on Nexus 7, a powerful new tablet with a vibrant, 7” 1280x800 HD display. The Tegra-3 chipset, with a quad-core CPU and 12-core GPU, makes everything, including games, extremely fast. And best of all, it’s only 340 grams, lighter than most tablets out there. Nexus 7 was built to bring you the best of Google in the palm of your hand. Hang out with up to 10 friends on Google+ using the front-facing camera, browse the web blazingly fast with Chrome and, of course, crank through your emails with Gmail. Nexus 7 comes preloaded with some great entertainment, including the movie "Transformers: Dark of the Moon," the book “The Bourne Dominion,” magazines like Condé Nast Traveler and Popular Science, and songs from bands like Coldplay and the Rolling Stones. We’ve also included a $25 credit to purchase your favorite movies, books and more from Google Play, for a limited time. Nexus 7 is available for preorder today from Google Play in the U.S., U.K., Canada and Australia, and starts at $199 in the U.S. It will start shipping mid-July. Nexus Q: It’s a sphere! It's great to be able to take your entertainment with you wherever you go, but sometimes you want to ditch the headphones and enjoy music with friends and family. So we’re introducing Nexus Q, which combines the power of Android and Google Play to easily stream music and video in your home—all controlled by an Android phone or tablet. Designed and engineered by Google, Nexus Q is a small sphere that plugs into the best speakers and TV in your house. It’s the first-ever social streaming device—like a cloud-connected jukebox where everyone brings their own music to the party. Available first in the U.S., you can preorder Nexus Q today from Google Play for $299, and it will ship mid-July. If you own one of the 400 million Android devices out there, you already know that it’s much more than simply a phone or tablet. It’s your connection to the best of Google—all of your stuff and entertainment, everywhere you go. Now you have a new version of Android, more entertainment and a growing portfolio of Nexus devices to choose from—all available in Google Play. The playground is open. Using large-scale brain simulations for machine learning and A.I. You probably use machine learning technology dozens of times a day without knowing it—it’s a way of training computers on real-world data, and it enables high-quality speech recognition, practical computer vision, email spam blocking and even self-driving cars. But it’s far from perfect—you’ve probably chuckled at poorly transcribed text, a bad translation or a misidentified image. We believe machine learning could be far more accurate, and that smarter computers could make everyday tasks much easier. So our research team has been working on some new approaches to large-scale machine learning. Today’s machine learning technology takes significant work to adapt to new uses. For example, say we’re trying to build a system that can distinguish between pictures of cars and motorcycles. In the standard machine learning approach, we first have to collect tens of thousands of pictures that have already been labeled as “car” or “motorcycle”—what we call labeled data—to train the system. But labeling takes a lot of work, and there’s comparatively little labeled data out there. Fortunately, recent research on self-taught learning (PDF) and deep learning suggests we might be able to rely instead on unlabeled data—such as random images fetched off the web or out of YouTube videos. These algorithms work by building artificial neural networks, which loosely simulate neuronal (i.e., the brain’s) learning processes. Neural networks are very computationally costly, so to date, most networks used in machine learning have used only 1 to 10 million connections. But we suspected that by training much larger networks, we might achieve significantly better accuracy. So we developed a distributed computing infrastructure for training large-scale neural networks. Then, we took an artificial neural network and spread the computation across 16,000 of our CPU cores (in our data centers), and trained models with more than 1 billion connections. We then ran experiments that asked, informally: If we think of our neural network as simulating a very small-scale “newborn brain,” and show it YouTube video for a week, what will it learn? Our hypothesis was that it would learn to recognize common objects in those videos. 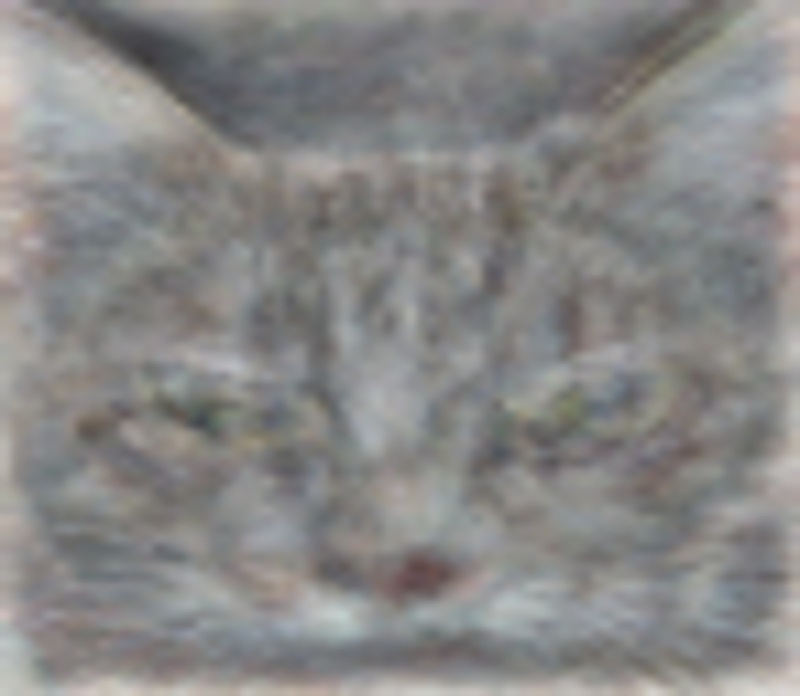 Indeed, to our amusement, one of our artificial neurons learned to respond strongly to pictures of... cats. Remember that this network had never been told what a cat was, nor was it given even a single image labeled as a cat. Instead, it “discovered” what a cat looked like by itself from only unlabeled YouTube stills. That’s what we mean by self-taught learning. One of the neurons in the artificial neural network, trained from still frames from unlabeled YouTube videos, learned to detect cats. Using this large-scale neural network, we also significantly improved the state of the art on a standard image classification test—in fact, we saw a 70 percent relative improvement in accuracy. We achieved that by taking advantage of the vast amounts of unlabeled data available on the web, and using it to augment a much more limited set of labeled data. This is something we’re really focused on—how to develop machine learning systems that scale well, so that we can take advantage of vast sets of unlabeled training data. We’re reporting on these experiments, led by Quoc Le, at ICML this week. You can get more details in our Google+ post or read the full paper (PDF). We’re actively working on scaling our systems to train even larger models. To give you a sense of what we mean by “larger”—while there’s no accepted way to compare artificial neural networks to biological brains, as a very rough comparison an adult human brain has around 100 trillion connections. So we still have lots of room to grow. And this isn’t just about images—we’re actively working with other groups within Google on applying this artificial neural network approach to other areas such as speech recognition and natural language modeling. Someday this could make the tools you use every day work better, faster and smarter. You may already be familiar with some shortcuts for Google Search, like using the search box as a calculator or finding local movie showtimes by typing [movies] and your zip code. But there are many more tips, tricks and tactics you can use to find exactly what you’re looking for, when you most need it. Today, we’ve opened registration for Power Searching with Google, a free, online, community-based course showcasing these techniques and how you can use them to solve everyday problems. Our course is aimed at empowering you to find what you need faster, no matter how you currently use search. For example, did you know that you can search for and read pages written in languages you’ve never even studied? Identify the location of a picture your friend took during his vacation a few months ago? How about finally identifying that green-covered book about gardening that you’ve been trying to track down for years? You can learn all this and more over six 50-minute classes. Lessons will be released daily starting on July 10, 2012, and you can take them according to your own schedule during a two-week window, alongside a worldwide community. The lessons include interactive activities to practice new skills, and many opportunities to connect with others using Google tools such as Google Groups, Moderator and Google+, including Hangouts on Air, where world-renowned search experts will answer your questions on how search works. Googlers will also be on hand during the course period to help and answer your questions in case you get stuck. Visit the course homepage to learn more. By the end of this course, you'll know several new techniques that will make you a Google Power Searcher and help you find out information about whatever you can imagine—from how to prepare for a new family pet to where moss grows on Stonehenge or how to grow katniss in your garden. Sign up now! Entrepreneurs all around the world are building technologies that empower their communities and address both local and global audiences. Last week, a team of Googlers from 10 countries gathered in Paris to spend time with entrepreneurs and startups at Le Camping, an accelerator program that’s part of Silicon Sentier, an association focused on supporting promising digital projects in the Ile de France region. We celebrated the results of the first two seasons of the program and welcomed the new startups for season three. Le Camping’s program selects 12 new startups each season (one season lasts six months). They “camp” in what used to be the facilities of the French Stock Exchange, symbolizing the bridge between the old and the new economy. During this time, the “campers” are coached by 60 mentors, mostly entrepreneurs but also engineers. We’ve been working in partnership with Le Camping for the last two seasons to provide hands-on training and mentorship to the 12 companies in each class. We’ve already seen great success from the program. Out of the 24 teams from first two seasons, 40 percent of the startups have raised funds, 60 percent have paying clients and all of the startups belong to a strong and reliable community. The program does not take equity in the startups or charge them to take part; all that’s required is vision, passion and the desire to address a global audience. This is just one of our efforts to support entrepreneurs in France. Last year we also launched Startup Cafe, an online platform which provides access to educational video content from several business schools designed for entrepreneurs, tools to help start a business and, with the help of the Agency for the Creation of Entrepreneurs, a map of public organizations that can help entrepreneurs. We believe that the Internet and entrepreneurship are key drivers of economic development. A study from the European Commission highlighted that small enterprises are the driver for growth and employment: they generate nearly 70 percent of jobs in Europe and 60 percent of economic value added. McKinsey’s "Impact of Internet on the French economy" reported that when French SMEs use more web technologies, their growth is faster, their operating revenues are higher and their profitability is stronger. We look forward to continuing to support entrepreneurship in France and are excited to follow the progress of the teams in season three of Le Camping: Home’n’go, Explee, Sketchfab, ForgetBox, Stormz, Fleex, Veezio, JellyNote, Augment, Webshell, Poutsch, Whale Street. Stay tuned! Google I/O, our annual developer conference, begins in just two days, and this year, we’re bringing you more than 130 technical sessions, 20 code labs and 155 Sandbox partners. If you’re not here in San Francisco, you can still sign up for one of our 350+ I/O Extended events around the world or tune in to I/O Live to watch the live stream from wherever you are. This year’s conference kicks off on June 27 with the first day’s keynote at 9:30 a.m. and the second day’s keynote on June 28 at 10:00 a.m. PDT, so tune in early at developers.google.com/io to avoid missing the action! Bookmark developers.google.com/io to watch I/O Live from your desktop, or download the Google I/O mobile app to access the live stream from your phone or tablet. For the truly entrepreneurial, check our liveblogging gadget, which lets you add your commentary and the live video feed from the Google I/O keynotes to your blog. More than 40 sessions on Android, Chrome, Google+ and your favorite APIs will be streamed live, and all remaining session videos will be recorded and available shortly after the conference on Google Developers Live and the conference website. Between sessions, we’ll bring you behind-the-scenes footage featuring interviews with Googlers and attendees, tours of the Sandbox and more. The stream will also continue through our After Hours party (June 27 starting at 7:00 p.m. PDT), where we've teamed up with top entertainers, inventors, artists, educators and visionaries from all over the world for an amazing evening. While students in the northern hemisphere say goodbye to each other and another school year, we’re in sunny San Diego meeting with thousands of educators and administrators at the International Society for Technology in Education (ISTE) conference. While on break from teaching, these folks are here to teach others how they’re bringing innovation into their classrooms—a lot of which centers around the web. While the web was developed well before today’s students were born, it’s come a long way even since a year ago. Today you can access the web on any device, use the web offline and take advantage of amazing graphics. For example, you can get a powerful graphing calculator on the web today, for free. It’s been really amazing to see how the web is impacting schools. 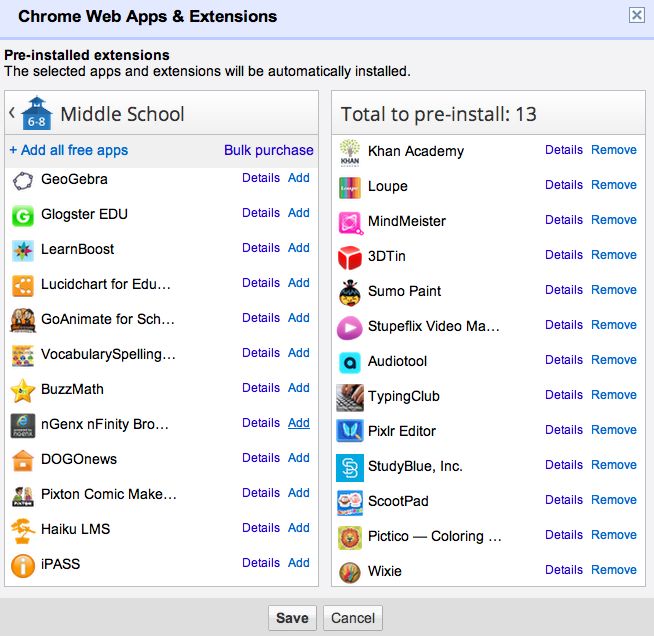 We’ve heard great real-world stories about Google Apps for Education, but lately we’re hearing more and more about schools extending the functionality of Google Apps with educational apps available on the Chrome Web Store. There are tens of thousands of apps in the Chrome Web Store, and today we’re adding some new ones: ST Math, VoiceThread and Acheive3000. To give you an idea of what’s possible on the web: Leyden High School District from Illinois is rolling out Chromebooks to their 3,500 students and are using apps like WeVideo, EasyBib, Vernier Labquest2, SlideRocket, Geogebra and Pearson’s OpenClass as part of their 1-to-1 learning initiative. Students at East Leyden High School work together on their Chromebooks. Photo credit: East Leyden Art Teacher Anna Reed. It’s great to see that many schools are choosing Chromebooks as an effective and affordable 1-to-1 education tool. There are more than 500 districts in the U.S. and Europe actively using Chromebooks, and today we’re pleased to welcome a few more to the community, including Rockingham Country Schools, N.C., Transylvania County Schools, N.C., and Fond du Lac School District, Wis.
Chromebooks are always new—just last month we announced new devices, an updated, app-centric user interface and new pricing for schools. Chromebooks also make it just as easy for administrators to distribute 10, 100 or 1,000 Chromebooks, saving precious summer vacation time previously spent installing software and policies on computers. And great news for schools looking to make hardware purchases: the PARCC and Smarter Balanced Assessment Consortia confirmed Chromebooks meet hardware and operating system requirements for student assessments in the 2014-2015 school year. Grade-level application packs are groups of Chrome Web Store apps that integrate tightly with Google’s suite of Apps for Education, divided by grade levels to meet different classroom needs. These packs are installable from the Chromebook management console. Many of them are free and we’ve worked with the app makers to offer discounts for bulk purchases. “The past is a foreign country—they do things differently there.” It’s a saying that rings especially true in the world of technology. But while innovating requires us to focus on the future, there are times when it’s important to look back. Today—the 100th anniversary of Alan Turing’s birth—is one such moment. Turing’s life was one of astounding highs and devastating lows. While his wartime codebreaking saved thousands of lives, his own life was destroyed when he was convicted for homosexuality. But the tragedy of his story should not overshadow his legacy. Turing’s insight laid the foundations of the computer age. It’s no exaggeration to say he’s a founding father of every computer and Internet company today. Algorithms are, in simplest terms, step-by-step instructions for carrying out a mathematical calculation. This is where it all started for programming since, at its core, all software is a collection of algorithms. A computing machine—today better known as a Turing machine—was the hypothetical device that Turing dreamed up to run his algorithms. In the 1930’s, a “computer” was what you called a person who did calculations—it was a profession, not an object. 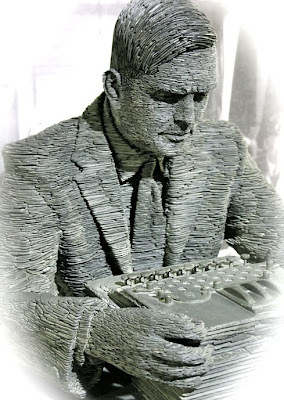 Turing’s paper provided the blueprint for building a machine that could do any computation that a person could, marking the first step towards the modern notion of a computer. Considering the role computers now play in everyday life, it’s clear Turing’s inventions rank among the most important intellectual breakthroughs of the 20th century. In the evolution of computing, all paths trace back to Turing. That’s why Turing is a hero to so many Google engineers, and why we’re so proud to help commemorate and preserve his legacy. In 2010, Google helped Bletchley Park raise funds to purchase Turing’s papers so they could be preserved for public display in their museum. More recently, we’ve been working closely with curators at London’s Science Museum to help put on a stunning new exhibition “Codebreaker - Alan Turing’s Life and Legacy.” This tells the story of Turing’s vast achievements in a profoundly moving and personal way, through an amazing collection of artifacts—including items loaned by GCHQ, the U.K. government intelligence agency, never before on public display. Topics addressed include Turing’s early years, his code-breaking at Bletchley Park, his designs for the Pilot Ace computer, his later morphogenesis work, as well as his sexuality and death. The exhibition opened on June 21 and is well worth a visit if you’re passing through London in the next year. And finally, we couldn’t let such a momentous occasion pass without a doodle. We thought the most fitting way of paying tribute to Turing’s incredible life and work would be to simulate the theoretical “Turing machine” he proposed in a mathematical paper. Visit the homepage today— we invite you to try your hand at programming it. If you get it the first time, try again... it gets harder! Turing was born into a world that was very different, culturally and technologically, from ours—but his contribution has never been more significant. I hope you’ll join me today in paying tribute to Alan Turing, the forefather of modern computing. Posted by Andrew Eland, Engineering Director, Google U.K.
A few months ago, we introduced Project Re: Brief, our experiment to reimagine online advertising. We took some of the most loved ad campaigns from the ‘60s and ‘70s and and brought them back to life for the digital age with the help of the advertising legends that made them in the first place. Together, we created a series of ads designed to start conversations and fire up imaginations about what technology can make possible, such as ads that enable two strangers on opposite sides of the world to connect over a can of soda, or that translate a customer service experience into an instant, shareable, personalized animated video. But Re: Brief is not just about the ads themselves. It’s also about the creative process behind them: bringing “old school” advertising legends and technologists into the same room to create digital ads that consumers love as much as they loved the iconic campaigns of yesterday. To share this experience, today we premiered the documentary film Project Re: Brief, directed by Emmy winner Doug Pray, at the Cannes Lions International Festival of Creativity—also available on YouTube. This hour-long documentary follows the story of the five art directors and copywriters who made the original ads as they come out of retirement to “Re: Brief” their classic campaigns: Harvey Gabor (Coca-Cola’s “Hilltop); Amil Gargano (Volvo’s “Drive it like you hate it”); Paula Green (Avis’ “We try harder”); and Howie Cohen and Bob Pasqualina (Alka-Seltzer’s “I can’t believe I ate the whole thing”). While major shifts in technology have reshaped the advertising business, as we learned from our heroes of the past, the basic tenets of storytelling haven’t changed. We found these icons’ ideas, wisdom and passion for great advertising inspiring and hope you do as well. For more details on the film and the Cannes Lions festival, visit our Agency Blog. Richard Ford, and Jerry Litt. There’s another new ferry under construction for the state of Washington and it’s not one of the big ones that plies the salty waters of Puget Sound. This one is a lot smaller but still fills a very important role. This ferry serves the Keller route across the Columbia River in Eastern Washington, and until this month, was without a name. “Sanpoil” is the anglicized form of the name that is applied to the original and current native residents of this area along the Columbia River. The name was chosen to honor the people who have lived on this land and crossed this river for thousands of years. The Washington State Transportation Commission approves names for state operated vessels. Our agency used a public process to gather a suggested name to be submitted to the Commission. During March 2012, we hosted an interactive website where citizens submitted vessel name suggestions with a supportive statement. We created an information card announcing the naming process, guidelines, and the opportunity to submit suggestions. The cards were distributed to users of the route by the ferry deckhands. We produced a special electronic email newsletter from the WSDOT Regional Administrator to over 1,000 subscribers of our agency’s Eastern Region electronic mailing list. We also sent out a media release announcing the naming process, guidelines and submittal procedure to print, broadcast, and web contacts within the Eastern Region. As a result, over 500 suggestions were received. Out of those, about 200 were within the parameters of the Commission Vessel Naming Guidelines with many duplicate suggestions. We sent those out to our committee of Tribal, Community, and Department representatives who reviewed the list. 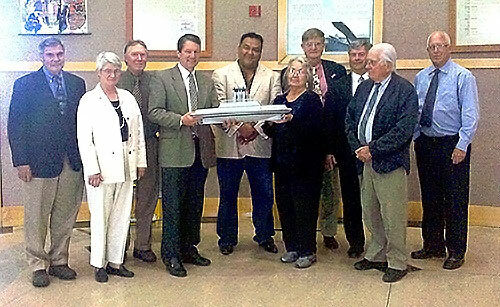 At a meeting in late May, the committee met and reached consensus on the name “Sanpoil” to submit to the Transportation Commission. The Keller Ferry crossing site was one of the most desirable in the whole territory for salmon fishing, and each year a huge trap was built across the Sanpoil River. It is estimated that as many as 400 people gathered in this area at the height of the salmon season. Several components of new boat are under construction in the Foss Rainier, Oregon shipyard. Later this fall, the parts will be trucked to Grand Coulee and assembled. The boat is expected to be launched in July 2013. Technology can make collaboration easier, cut costs and help operations run more efficiently. Unfortunately, the organizations trying to solve some of the world’s most difficult problems—nonprofits—often lack resources to fully take advantage of technology to further their causes. That’s why we worked with the HandsOn Network, a Points of Light Enterprise, to create HandsOn Tech, an initiative that pairs U.S. nonprofits with individuals who are passionate about technology and looking to make a difference. Last year, we funded 24 full-time AmeriCorps VISTA positions. These VISTA members provided technology training to more than 1,300 small, poverty-focused nonprofits nationwide. Further, these VISTA participants engaged skilled volunteers, including lots of Googlers, to assist nearly 200 nonprofits in creating individualized, comprehensive tech plans that will help them to work more efficiently. Migrating Dreams for Kids, a Chicago nonprofit empowering at-risk and disabled youth, to Google Apps—enabling them to more efficiently and effectively collaborate without the restriction of limited office space. Building a dynamic website and social media strategy for Doing Art Together, a NYC-based nonprofit providing hands-on programming and GED prep for under-resourced youth. Using Google Maps and Fusion Tables to help Atlanta’s The Drake House create a map that helps staff better visualize the local homeless population in order to more effectively distribute their services. The program has been so successful that we’re expanding—it will now include one additional city and 28 new VISTA positions, with the goal of reaching even more nonprofits. The new HandsOnTech VISTAs will start in August with a one week training at our campus in Mountain View, Calif., where they’ll learn about cloud-based tools from a variety of technology companies including the Google For Nonprofits suite that allows many nonprofits to use free online advertising, Google Apps and YouTube channels. Once they are armed with tech know-how they’ll spend the rest of the year in two and three-person teams serving nonprofits in the Bay Area, Atlanta, Boston, Chicago, Detroit, New York City, Pittsburgh and Seattle. HandsOn Tech is accepting applications for VISTA members now through June 27. If you’re passionate about technology and helping nonprofits on the front line of fighting poverty, then we hope you’ll apply! The Miami-Illinois language was considered by some to be extinct. Once spoken by Native American communities throughout what’s now the American Midwest, its last fluent speakers died in the 1960s. Decades later, Daryl Baldwin, a citizen of the Miami Tribe of Oklahoma, began teaching himself the language from historical manuscripts and now works with the Miami University in Ohio to continue the work of revitalizing the language, publishing stories, audio files and other educational materials. Miami children are once again learning the language and—even more inspiring—teaching it to each other. Daryl’s work is just one example of the efforts being made to preserve and strengthen languages that are on the brink of disappearing. Today we’re introducing something we hope will help: the Endangered Languages Project, a website for people to find and share the most up-to-date and comprehensive information about endangered languages. Documenting the 3,000+ languages that are on the verge of extinction (about half of all languages in the world) is an important step in preserving cultural diversity, honoring the knowledge of our elders and empowering our youth. Technology can strengthen these efforts by helping people create high-quality recordings of their elders (often the last speakers of a language), connecting diaspora communities through social media and facilitating language learning. 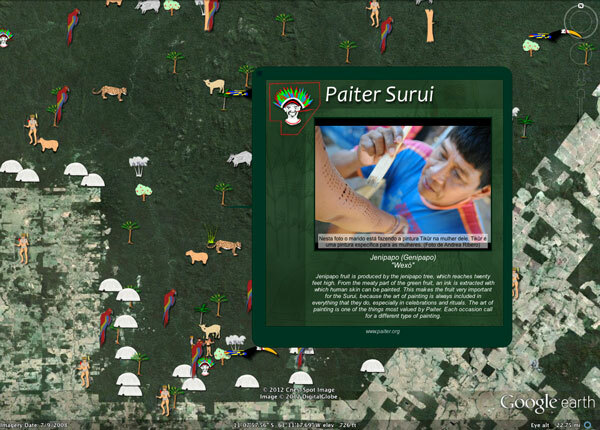 The Endangered Languages Project, backed by a new coalition, the Alliance for Linguistic Diversity, gives those interested in preserving languages a place to store and access research, share advice and build collaborations. People can share their knowledge and research directly through the site and help keep the content up-to-date. A diverse group of collaborators have already begun to contribute content ranging from 18th-century manuscripts to modern teaching tools like video and audio language samples and knowledge-sharing articles. Members of the Advisory Committee have also provided guidance, helping shape the site and ensure that it addresses the interests and needs of language communities. Google has played a role in the development and launch of this project, but the long-term goal is for true experts in the field of language preservation to take the lead. As such, in a few months we’ll officially be handing over the reins to the First Peoples' Cultural Council (FPCC) and The Institute for Language Information and Technology (The LINGUIST List) at Eastern Michigan University. FPCC will take on the role of Advisory Committee Chair, leading outreach and strategy for the project. The LINGUIST List will become the Technical Lead. Both organizations will work in coordination with the Advisory Committee. As part of this project, research about the world’s most threatened languages is being shared by the Catalogue of Endangered Languages (ELCat), led by teams at the University of Hawai’i at Manoa and Eastern Michigan University, with funding provided by the National Science Foundation. Work on ELCat has only just begun, and we’re sharing it through our site so that feedback from language communities and scholars can be incorporated to update our knowledge about the world’s most at-risk languages. Building upon other efforts to preserve and promote culture online, Google.org has seeded this project’s development. We invite interested organizations to join the effort. By bridging independent efforts from around the world we hope to make an important advancement in confronting language endangerment. This project’s future will be decided by those inspired to join this collaborative effort for language preservation. We hope you’ll join us. Before joining Google, I lived in Hawaii for several years. Now, one look at a photo of palm trees swaying in front of an impossibly blue-green ocean transports me back to the islands—relaxing on the beach and listening to the sound of waves crashing on the shore. If one photo can do that for you, how would you feel if you had access to millions of them? We begin our island adventure on Oahu, home to the capital city of Honolulu and a number of popular destinations. This island has something for everyone, from the top surfing locations of Waikiki Beach and Waimea Bay, to the USS Arizona Memorial Museum and Iolani Palace for history buffs, to the home of the NFL Pro Bowl at Aloha Stadium. Fans of the TV shows “Lost” and “Hawaii Five-0” or movies like “Jurassic Park” will love looking around for filming locations at Kualoa Ranch. Hopping over to Maui, we can sunbathe at oceanfront resorts in Ka’anapali, hit the links on challenging golf courses in Kapalua and learn the hula at the famous Old Lahaina Luau. One of my favorite memories of Maui is driving along the scenic “Road to Hana” with my friends, an experience I can now relive with Street View. We now fly over to the island of Hawaii, also known as the Big Island, where we visit one of the most active volcanoes in the world at Hawaii Volcanoes National Park. We check out the scene in the funky seaside town of Kailua-Kona, explore tropical gardens in Hilo, and climb above the clouds on Mauna Kea. We end our Big Island sojourn with a little oceanside relaxation at the luxurious resorts in Waikaloa, Kamuela or Hualalai. Over on Molokai, people enjoy the quiet life. With no buildings taller than a coconut tree and not a traffic light to be seen, miles of untouched shorelines and excellent outdoor activities will help you leave the modern world behind. Now let’s jump to the incomparable Kauai, with its jaw-dropping landscapes around every turn. Whether you’re staying in Poipu or Hanalei, be sure to visit Waimea Canyon, which Mark Twain called the “Grand Canyon of the Pacific”. You might also enjoy a leisurely stroll along the coast at Lydgate State Park. Our virtual tour of Hawaii comes to an end on the romantic, tiny island of Lanai, the “pineapple island.” This island has so many memories for me, from the day I proposed to my wife (a few hundred feet from here) to the morning we spent swimming with dolphins in Hulopoe Bay. I can’t wait to go back again! An upcountry retreat on the romantic island of Lanai. We hope this little taste of Hawaii will inspire you to use Street View the next time you're planning a vacation—whether you’re taking a trip around the block, across the world or just down memory lane. Check out a more complete list of Street View’s off-the-road locations in Hawaii here or visit our Scenic Hawaii collection in the Street View gallery. 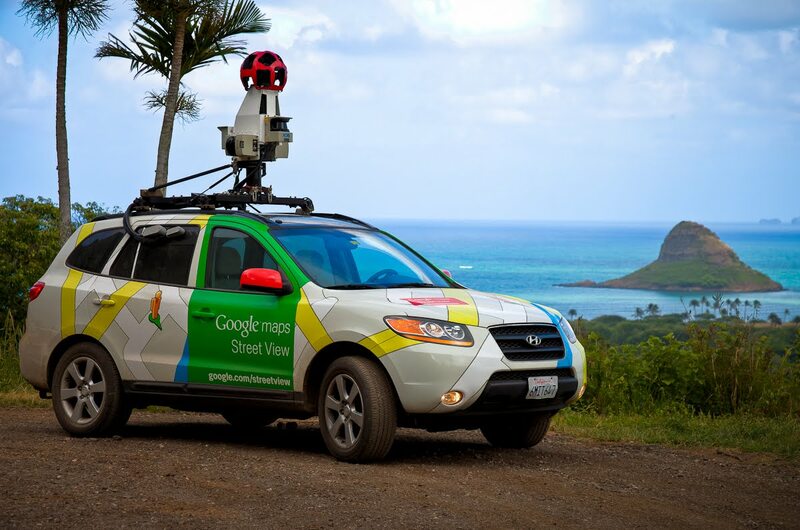 Street View car at Kualoa Ranch on the windward coast of Oahu. In this post, we've collected some highlights from the past five years of our Safe Browsing efforts, aimed at keeping people safe online. See the Security Blog for the full details and more visuals. -Ed. 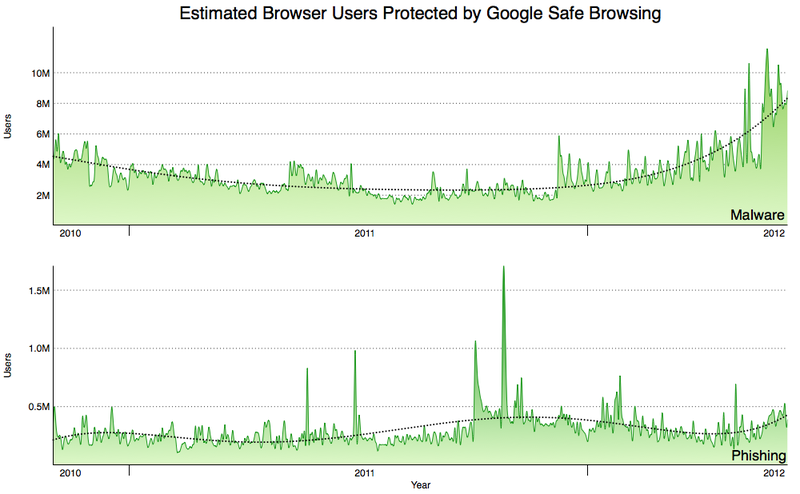 Five years ago, we launched Safe Browsing, an initiative designed to keep people safe from malicious content online. Our primary goal was to safeguard Google's search results against malware (software capable of taking control of your computer) and phishing (fraudulent websites that entice users to give up their personal information). We also wanted to help educate webmasters on how to protect their own sites. Malware and phishing are still big problems online, but our Safe Browsing team has labored continuously to adapt to the rising challenges of new threats. We've also developed an infrastructure that automatically detects harmful content around the globe. We protect 600 million users through built-in protection for Chrome, Firefox and Safari, where we show several million security warnings every day to Internet users. When we detect malware or phishing, we trigger a red warning screen that discourages clicking through to the website. Our free and public Safe Browsing API allows other organizations to keep their users safe by using the data we’ve compiled. 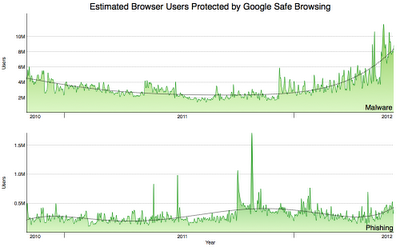 We find about 9,500 new malicious websites every day and show warnings to protect users. These are either innocent websites that have been compromised by malware authors, or others that are built specifically for malware distribution or phishing. Our detection techniques are highly accurate—we have had only a handful of false positives. Approximately 12-14 million Google Search queries per day warn users about current malware threats, and we provide malware warnings for about 300 thousand downloads per day through our download protection service for Chrome. We send thousands of notifications daily to webmasters. When webmasters sign up for Webmaster Tools we give them the option to receive warning notices if we find something malicious on their site. Malware and phishing aren’t completely solvable problems because threats continue to evolve, but our technologies and processes do, too. Online commerce sites are still favorite phishing targets because phishers are motivated by money. Some tried-and-true phishing methods are still used, but attacks are also getting more creative and sophisticated. Attacks are faster, with phishers sometimes remaining online for less than an hour to try to avoid detection. They’re also more geographically dispersed and are getting more targeted. Malware authors often compromise legitimate sites to deliver content from a malicious attack site or to redirect to an attack site. These attack sites will often deliver "drive-by downloads" to visitors, which launch and run malware programs on their computers without their knowledge. To try to avoid detection, these attack sites adopt several techniques, such as rapidly changing their Internet location with free web hosting services and auto-generated domain names. Although less common than drive-by downloads, we’re also seeing more malware authors bypassing software vulnerabilities altogether and instead employing methods to try to trick users into installing malicious software—for example, fake anti-virus software. Our system is designed to protect users at high volumes, but people still need to take steps to keep their computers safe. Ignoring a malware problem is never a good idea—if one of our warnings pop up, you should never click through to the suspicious site. Webmasters can help protect their visitors by signing up for malware warnings at Google Webmaster Tools. These warnings are free and will help us inform them if we find suspicious code on their sites. Finally, everyone can help make our system better. You can opt-in to send additional data to our team that helps us expand the coverage of Safe Browsing. It’s a good feeling to know that we’re making the web more secure and directly protecting people from harm—whether they’re our users or not. We continue to invest heavily in the Safe Browsing team so we can defend against current and future security threats. We’re obsessed with building energy efficient data centers that enable cloud computing. Besides helping you be more productive, cloud-based services like Google Apps can reduce energy use, lower carbon emissions and save you money in the process. Last year, we crunched the numbers and found that Gmail is up to 80 times more energy-efficient (PDF) than running traditional in-house email. We’ve sharpened our pencils again to see how Google Apps as a whole—documents, spreadsheets, email and other applications—stacks up against the standard model of locally hosted services. Our results show (PDF) that a typical organization can achieve energy savings of about 65-85 percent by migrating to Google Apps. Lower energy use results in less carbon pollution and more energy saved for organizations. That’s what happened at the U.S. General Services Administration (GSA), which recently switched its approximately 17,000 users to Google Apps for Government. We found that the GSA was able to reduce server energy consumption by nearly 90 percent and carbon emissions by 85 percent. That means the GSA will save an estimated $285,000 annually on energy costs alone, a 93 percent cost reduction.